For the Canadian town, see Cupar, Saskatchewan. For other uses, see Cupar (disambiguation). 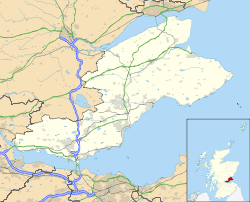 Cupar (/ˈkuːpər/ listen ; Scottish Gaelic: Cùbar) is a town, former royal burgh and parish in Fife, Scotland. It lies between Dundee and Glenrothes. 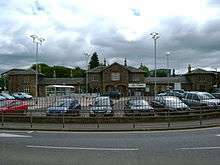 According to a 2011 population estimate, Cupar had a population around 9,000, making it the ninth largest settlement in Fife, and the civil parish a population of 11,183 (in 2011). It is the historic county town of Fife, before the council moved to Glenrothes. The town is believed to have grown around the site of Cupar Castle, which was the seat of the sheriff and was owned by the earls of Fife. The area became a centre for judiciary as the county of Fife and as a market town catering for both cattle and sheep. Towards the latter stages of the 13th century, the burgh became the site of an assembly of the three estates - clergy, nobility and burgesses - organised by Alexander III in 1276 as a predecessor of the Parliament of Scotland. Although written information of a charter for the modern town was lost, evidence suggested that this existed as one of the many properties owned by the Earls of Fife by 1294. During the middle of the 14th century, the burgh started to pay customs on taxable incomes, which probably meant that royal burgh status was granted sometime between 1294 and 1328. The oldest document, referring to the royal burgh, was a grant by Robert II in 1381 to give a port at Guardbridge on the River Eden to help boost trade with Flanders. This grant was officially recognised by James II in 1428. Cupar is represented by several tiers of elected government. Cupar Community Council is the lowest. Its statutory role is to communicate local opinion to local and central government. Fife Council, the unitary local authority for Cupar based in Glenrothes, is the executive, deliberative and legislative body responsible for local governance. The Scottish Parliament is responsible for devolved matters such as education, health and justice while reserved matters are dealt with by the Parliament of the United Kingdom. The Cupar area supports three multi-member wards with eleven councillors sitting on the committee of Fife Council. County Buildings on Catherine Street are the main headquarters for the east region of Fife Council, which deals with administrative, planning and agricultural issues. Cupar forms part of the North East Fife, electing one Member of Parliament (MP) to the House of Commons of the Parliament of the United Kingdom by the first past the post system. The constituency is represented by Stephen Gethins, MP of the Scottish National Party. For the purposes of the Scottish Parliament, Cupar forms part of the North East Fife constituency. The North East Fife Scottish Parliament (or Holyrood) constituency created in 1999 is one of nine within the Mid Scotland and Fife electoral region. Each constituency elects one Member of the Scottish Parliament (MSP) and the region elects seven additional members to produce a form of proportional representation. The constituency is represented by Rod Campbell for the SNP. At EU level, Cupar is part of the pan-Scotland European Parliament constituency which elects seven Members of the European Parliament (MEP)s using the d'Hondt method of party-list proportional representation. Currently, Scotland returns two SNP MEPs, two Labour MEPs, only one Conservative and Unionist MEP, and no Liberal Democrat MEPs, to the European Parliament. The 2001 census reported a population of 8,506, which increased slightly to around 8,980 in 2008. The demographic make-up resembles the rest of Scotland. The 30–44 age group formed the largest portion of the population (22%). The median age of males and females was 39 and 43 years respectively, compared to 37 and 39 years for the whole of Scotland. The economic activity of residents aged 16–74 was 42.20% in full-time employment, 12.32% in part-time employment, 5.89% self-employed, 3.10% unemployed, 2.96% students with jobs, 3.94% students without jobs, 17.68% retired, 4.83% looking after home or family, 4.35% permanently sick or disabled, and 2.72% economically inactive for other reasons. Compared with Scotland's average demography, Cupar has a lower proportion of immigrants, but a higher proportion of over-75s. Old Gaol was designed by James Gillespie Graham and built 1813-14. After closing as a prison in 1844, it was used by the militia. It was purchased by William Watt (seedsman) in 1895 and occupied by that firm until 1988. Currently it operates as Watts of Cupar, a bar and restaurant. The historic town centre is the junction of Bonnygate and the Crossgate. This is where the town's mercat cross, is located with the original shaft being supported by a unicorn. It dates from 1683. To the east is St Catherine Street, home to the burgh chambers and county buildings, both designed by Robert Hutchison. The Category B listed burgh chambers built around 1815 and 1818 contain a three story bow street corner and a domic entrance. The adjacent Category B listed county buildings built between 1812 and 1817 are unique in Fife as the only example replicating the style of buildings in the New Town of Edinburgh. The Category B-listed corn exchange tower can be seen across the town skyline. At the east end of St Catherine Street is the Category B-listed Cupar War Memorial in a classical Greek style overlooking the Cart Haugh, one of several designed by John Kinross with assistance from leading contemporary sculptors, for the exception of the Victory statue which was done by Henry Snell Gamley. 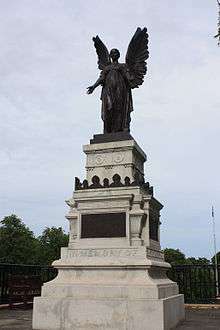 The memorial was first unveiled by Field Marshal Earl Haig in 1922 and then again for the addition of the World War II memorial in 1950 by the Earl of Elgin. Nearby on Coal Road is a former Category B-listed classical style prison building built between 1813 and 1814. 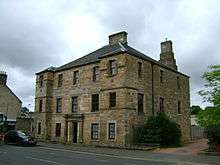 On the bonnygate, the Category A-listed Preston Lodge built by the Laird of Airdrie is the town's second oldest building. The house was built in 1623 and is inscribed on a stone on the west wall. The house was extended in 1702 by James Preston and was remodeled by London goldsmith William Preston, in 1765. Later, the Reverend Sir James Preston occupied the house between 1775 and 1791, when he was the minister of the Cupar Old Parish Church. The original design of the building is believed to have been inspired by Culross Palace in Culross. Situated at the corner of the Crossgate, the Category C listed Duncan's Institute by John Milne, which was built 1870-71 as a mechanics' institute for the "working classes of Cupar" by Mrs Duncan. The building, a mixture of Gothic, Scottish and Flemish styles is recognised in the town for its twisted spire. 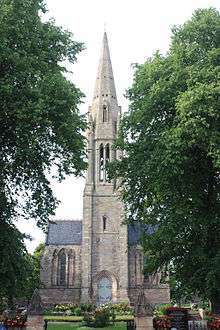 On the Kirkgate is the Parish Church of Cupar Old and St Michael of Tarvit, designed by the architect, Hay Bell. This consists of the Category A-listed Parish Church tower dating from 1415 and the Category B-listed main church building from 1745. 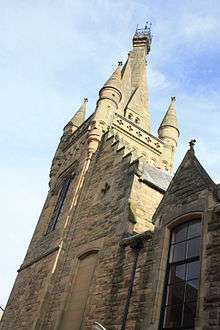 The tower is the only surviving piece of the old Cupar parish church, founded by the priory of St Andrews. To the south of the town on the A914 and A916 is the Category A-listed Hill of Tarvit mansion house and nearby Category A listed Scotstarvit Tower. The Hill of Tarvit was formerly known as Wemyss Hall, designed by Sir Walter Bruce around 1692. When the house was sold in 1904, Robert Lorimer was commissioned to design a bigger house compared to the existing Wemyss Hall to be able to hold the owner's French architecture. This was completed around 1907 and 1908, granting the present name Hill of Tarvit. The house's interior showcased the owner's love of antique furniture ranging from Flemish tapestries; Louis V; Louis XI; English and Scottish have been considered to be Lormier's best work. The service accommodation showcases the range of rooms and equipment used by a family, prior to the First World War. Situated between the Tarvit and Walton Hills, is Scotstarvit Tower, a well-preserved simple L-plan early 17th century tower house of five stories and an attic. To the north of the town is Hawklaw, which operated as a Government Radio Receiving Station between 1942 and 1988. Fife Council is the largest employer in the area. Many people are employed in food and drink. The larger employers were Kettle Produce (fruit and vegetable producer) and Fishers Services Ltd. Other employers include Elmwood College (Fife education); Scotsfruit Ltd (food and drink); Quaker Oats Ltd (food and drink) and Fisher and Donaldson (food and drink). Some 72% people were employed in the town in 2007, with unemployment below the national average at 2.1%. The main shopping facilities are located there, including family-owned businesses and some chain stores. The Cupar and Howe of Fife local plan includes a proposal to upgrade shopping facilities to produce a secondary retail area in Fife. Cupar has an unusual golf course on the side of a hill to the South of town at Hill of Tarvit. It uses hickory for the clubs, in the original style. Cupar Sports Centre has a 25 metre swimming pool, badminton courts, squash courts and a fitness suite. The swimming pool is the base for Cupar and District Swimming Club. Cupar is home to Cupar Cricket Club, founded in 1884. The club is celebrating its 125th anniversary in the 2009 season. The Castlehill Community Association is home to local groups including Cupar Camera Club, Cupar Art Club, Cupar & District Model Railway Club. They operate from the Old Castlehill Primary School and from 11 St Catherine Street. 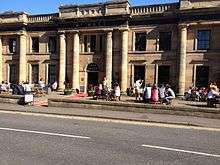 Cupar also plays host to the biennial Cupar Arts Festival. Cupar is home to Kilmaron school, one secondary school and two primary schools. Castlehill Primary School opened to pupils on the present site in 1975 and is located on the town's outskirks and has enrollment of 420. Kilmaron School caters for disabled children. Bell Baxter High School located on Carslogie Road, serves both the town and surrounding villages. The School roll was recorded in February 2009 and was estimated at 1620 pupils. Elmwood College has three main campuses situated in the town and surrounding area. The college has been praised as a centre for excellence in golf-related studies and specialising in land-based education. Local businesses benefit from the work of the Elmwood Rural Business Centre. An express bus service connects the town every hour between Edinburgh and St Andrews and also between Glasgow and St Andrews. Other services run less frequently from Stirling and various local villages through Cupar to St Andrews. An express service also runs via the town from Kirkcaldy to Dundee. A railway station can be found to the south-east of the town centre. The station is situated on the East Coast Main Line, served by Abellio ScotRail and CrossCountry with regular services running between Edinburgh Waverley and Aberdeen. Nearby stations are located to the north-east of the town at Leuchars and to the south of the town in neighbouring Springfield (limited service) and Ladybank. The nearest major international airport is Edinburgh airport with the nearest ferry sea port at Rosyth being 42 miles and 35 miles, respectively. Cupar is home to 'C Squadron' of the Scottish and North Irish Yeomanry. The SNIY provides a Light Cavalry capability and have travelled to Germany and USA on training and on operations in Afghanistan, Iraq and Cyprus. They previously operated the FV107 Scimitar, FV105 Sultan and FV103 Spartan light armoured vehicles in the a reconnaissance role. They are under the command of the Royal Scots Dragoon Guards based at Leuchars Station (formerly RAF Leuchars). The Army Cadet Force and Air Training Corps 571 (Cupar) Squadron are also active in the town. Colonel Robert Hope Moncrieff Aitken VC (1826–1887), recipient of the Victoria Cross during the Indian Mutiny, was born in Cupar. Henrietta Keddie, who wrote as Sarah Tytler, was born in Cupar in 1827. Lady Henrietta Gilmour (1852–1926) pioneer photographer, lived at Denbrae House north of Cupar and is buried in Cupar Cemetery. Robert Robertson FRS, chemist and former the government chemist, was born in Cupar in 1869. Jane Stocks Greig, physician and public health specialist, was born in Cupar in 1872. Rab Noakes, singer-songwriter, is from Cupar. Margaret Boyd, local historian and author, founded the Cupar Historical Society. 1 2 "Mid-2008 Population Estimates – Localities in order of size". General Register Office for Scotland. 2008. Archived from the original on 2 July 2010. Retrieved 2010-09-08. ↑ Complete Atlas of the British Isles. Readers' Digest. 1965. p. 218. ↑ Martin 2006, p. 9. 1 2 Lamont-Brown 2002, p. 49. 1 2 Martin 2006, pp. 9-10. 1 2 3 4 5 6 7 8 9 10 11 12 Pride 1999, pp. 106-111. ↑ "Reserved and devolved matters". Scotland Office. Archived from the original on 21 October 2008. Retrieved 2010-02-24. ↑ "Cupar's councillors". Fife Council. Retrieved 2008-01-11. ↑ "County Buildings, headquarters of the East Region". Fife Council. Retrieved 2008-01-11. ↑ "Regional MSPs for Mid Scotland and Fife". Scottish Parliament. Retrieved 2010-01-06. ↑ "MSP for North East Fife". Scottish Parliament. Retrieved 2011-06-24. ↑ "UK MEPs - Scotland". European Parliament. Archived from the original on 7 October 2006. Retrieved 2011-02-14. 1 2 "Comparative Population: Cupar Locality Scotland". scrol.co.uk. 2001. Retrieved 2008-11-25. ↑ "Comparative Population Profile: Fife Council Area Scotland". scrol.gov.uk. 2001. Retrieved 2008-11-25. 1 2 "Comparative Employment Profile: Cupar Locality Scotland". scrol.gov.uk. 2001. Retrieved 2008-11-25. ↑ "Comparative Employment Profile: Fife Locality Scotland". scrol.gov.uk. 2001. Retrieved 2008-11-25. ↑ "Bar and Bistro". Watts of Cupar. Retrieved 2013-10-08. ↑ "Historic Scotland: County Buildings listed report". Historic Scotland. Retrieved 2011-03-05. ↑ Omand 2000, p. 200. 1 2 "Cupar War Memorial". Historic Scotland. Retrieved 2011-03-05. ↑ "Historic Scotland: Watts listed report". Historic Scotland. Retrieved 2011-03-05. ↑ "Historic Scotland: Preston Lodge listed report". Historic Scotland. Retrieved 2011-03-05. 1 2 Boyd 1989, p. 32. ↑ "Historic Scotland: Duncan Institute listed report". Historic Scotland. Retrieved 2011-03-05. ↑ "Historic Scotland: Parish Church of Cupar Old and St Michael of Tarvit listed report". Historic Scotland. Retrieved 2011-03-05. ↑ Omand 2000, p. 134. ↑ "Historic Scotland: Hill of Tarvit listed report". Historic Scotland. Retrieved 2011-03-05. ↑ "Scotstarvit tower". Historic Scotland. Retrieved 2008-12-20. 1 2 Walker & Ritchie 1996, p. 106. 1 2 3 Walker & Ritchie 1996, p. 89. ↑ Pride 1999, p. 92. 1 2 3 "Cupar and Howe of Fife Economic Profile" (PDF). Fife Council. Spring 2007. Retrieved 2008-12-04. ↑ "Cupar Sports Centre". Fife Council Community Services. 2001. Retrieved 2009-02-26. ↑ "A list of all primary schools in Fife". Fife Council. Retrieved 2010-02-28. ↑ "A list of all secondary schools in Fife". Fife Council. Retrieved 2010-02-28. ↑ "Castlehill Primary School". Fife Council. Retrieved 2010-03-03. ↑ "Bell Baxter High School 2009 Inspection". HMIE. Retrieved 2010-03-02. ↑ "Robert Hope Moncrieff Aitken". victoriacross.org.uk. Retrieved 2011-11-18. Boyd, Margaret (1989). Cupar: In Old Picture Postcards. 2. ISBN 9028848657. Omand, Donald (2000). The Fife Book. Birlinn Publishing. Pride, Glen L. (1999). Kingdom of Fife (2nd ed.). The Rutland Press. Martin, Paula (2006). Cupar: The History of a small Scottish town. Edinburgh: Birlinn Publishing. Walker, Bruce; Ritchie, Graham (1996). Fife, Perthshire and Angus. ISBN 0114952868. Wikimedia Commons has media related to Cupar.